Rock RMS Reviews Recently Reviewed! Overall: We were stuck on another piece of software that still looked and ran like it was from the early '90s, but unable to afford anything better, for years. We got into Rock very early after its launch and haven't looked back! From an admin standpoint, I've been extremely happy with the direct access to the data it's afforded me, while keeping the users in a wonderful and user-friendly environment that's available from anywhere. Most reports are available easily enough per the documents, but every once in a while you'll find a more esoteric view of your data that can't be done "out of the box" yet (the reporting functions are growing quickly). No problem- the amazing community has helped us generate any reports we could hope for using powerful tools like SQL queries. And that's an important point to mention, despite the fact that there's no official support for Rock, the community is by far the best support for any product I've ever seen. A word of personal advice: if you're trying to save a few bucks, you may be looking at running Rock locally on a Windows Server, but if you do, understand that you'll need to be comfortable configuring SQL servers and web servers, as well as firewall rules and SSL certificates. I highly recommend any of the many hosting companies who support Rock instead, if that's not your particular cup of tea...many of those companies make Rock a nearly turnkey solution. RockRMS is the easiest to use, implement, and train on software I have ever used, period! 1. Rock is open AND extensible. We no longer have to compromise on the way we manage our ministry. The software can be configured to work with the way our ministry teams need. 3. RockRMS' "Shop" has given us access to tools and ways to accomplish the 'fringe' needs that pop up in a supported way. We can say 'yes' to the "Is it possible" question instead of "not with our software"
Cons: The biggest hurdle that I (and my org) had to work to overcome was taking a more involved and invested approach to integrating and using the software in our ministry areas. Overall: More people are using our Church Management System than ever. Ministry staff interact with it, and the data helps them to build relationships with people. Groups as a central tool (instead of just small groups) gives our teams a common tool that provides clear understanding or what smaller groupings of people look like. We haven't even fully integrated our giving processes, and we're anxious to leverage Rock's abilities there, as it's WAY easier. Overall: We moved from Arena to Rock in tandem with some changes we were going through as far as how we do ministry. Rock either has a feature or gives you the tools to make the feature, for whatever your church can dream of. Rock is a very powerful ChMS solution that continues to get better without forcing you to make budget cutbacks in ministries to afford it. A really easy to overlook benefit to using Rock, it's really easy to understand what you're looking at when a page loads because the pages are designed with that in mind. This is a huge benefit when training Volunteers or rotating staff (like interns). The community is great! There's a strong community of Rock users that share a Slack channel and help one another innovate at their church and to fix problems when they arise. You no longer have to sit through the tier-0 checklist you normally get when calling tech support, rather you get to have a conversation with real people that have been working with Rock since before you ever knew about it. Being a part of this Rock community is what keeps me from being afraid of tackling all of my church's ChMS needs "without a team". The most exciting thing about Rock is how customizable it is. Rock's Workflow Engine allows you to be very attentive to all of your attendees without having to manually check up on each person. You can do processes as simple as texting someone who visited for the first time a thank you message and an invite to coming events. You can even build full-featured follow-ups to someone joining a small group to make sure it's a great fit. The possibilities are actually limitless. Recommendations to other buyers: Rock is MUCH more powerful if you have someone who can dedicate time to understanding your ministries and work to make Rock serve them well. Pros: Have you ever thought it was weird that a private hedge-fund bought both Fellowship One and Shelby and created a quiet monopoly in the ChMS market? Rock is the free, open-source rebellion against monopoly higher prices and lower service for church software. With Rock you have a church database system that allows you to automate ministry workflows and view ministry reports. Want to see "Show me everyone who's attended twice, who's not in a small group, who lives within 2 miles of an open small group". And then you can put that into a list to send an email to them, or make a list for a pastor to call. The best part of Rock is how easy it is to get help and support in the community slack chat. Rock users hang out there all day and answer each other's questions. Cons: You install Rock on your own server. Going from "I'm interested" to "we are setup and running" is the hardest part. You'll probably need a tech-savvy person at your church OR work with a Rock Partner (professional consultants). One common path is take advantage of Microsoft's $3,000 non-profit credits to host on their Azure cloud hosting. So if between saving the money you'd spend on your current ChMS and having effectively free hosting on Azure, there's a big incentive/budget to get yourself over the "we are now setup" hurdle. Pros: Rock is so powerful and open. Our church is a fairly large multi-site church in West Texas and Eastern New Mexico. We had been looking for a product to transition to for several years that met the needs of our ministries. Rock has met all those needs. There are tons of great features and a growing app store and eco system that allow you to add just about anything you and your church can dream up. There's great community support that's free and several amazing vendors that can support churches of ANY size or develop custom code for a feature you wish you had. You can run it on your local server or install it in the cloud. It's easy to learn, intuitive and works on ANY device. It's mobile friendly and your teams can expect to be able to do anything from their smartphones that they can do from a computer. The developers have a great roadmap and have a track record of hitting or beating expected release dates. It's also great to finally feel like we have a voice with our CHMS platform. Can't say enough good things about it. Cons: I honestly haven't found anything that I don't like. It's really hard to find anything. If had to choose something that I like "least" I guess it would be the documentation needs to be updated a little but that's being SUPER geek nit picky because the documentation is MUCH better than our former software. Overall: Our mission is to love people as we lead them into a growing relationship with Jesus Christ. This software helps our teams do exactly that by making the technology invisible and bringing relationships and connections to new levels. Pros: Although I am a developer that has made many customizations to the software, I am consistently impressed with how well-designed all of the features are, and how many of them there are. A church could do incredible things with this software without employing a developer. But when we do choose to customize or build new features, Rock makes this process incredibly easy compared to other systems I have worked on. New versions are released all the time with a plethora of new features. Just when you think Rock couldn't possibly do any more for your church, they announce a new version with things you never knew you wanted but now must have! Cons: Anything I could mention here would be nitpicking. Overall: I have heard from many of the church staff from different ministries that they genuinely enjoy using Rock, and it saved us from using multiple different systems with separate, redundant databases of our congregants. Everyone's jobs are made easier with Rock. The community is incredible and the core development team works closely with us to make sure that any changes we're making are the best they can be for us and for the community. It's an absolute pleasure working with Rock. Hands down, the best church management system we've ever used. Pros: Rock comes with a ton of functionality out of the box, and the user interface is snappy, clean, intuitive, mobile-friendly, and highly customizable by non-developers. The Rock community is just as responsive as the product, so the combination of superb/forward-thinking innovation and community support makes this product second to none. Amazing, new features are always being added to the product by the core team or by developer/partner contributions to Rock's app store. The mission statement at Southeast is "to connect people to Jesus and to one another." Rock is one of the tools that helps us accomplish this goal on a daily basis. I look forward to seeing the Kingdom impact that this product will have as it gets rolled out to more churches and organizations across the globe. Cons: It not only takes a village to raise children, but also to speed up the development of an open source project. Rock needs more people with skin in the game giving financial, prayer, development, product evangelism, training, and documentation support. The sky is the limit with God's blessing and the backing of more Kingdom workers. Overall: Full-featured church management system that scales to churches of any size. The product is highly extensible and built on cutting-edge technology. The next generation of church management systems is here! Pros: Open source, shared community, highly active Slack support community, plugin shop, fast growing wave of adoption... Look, this is the future of church software. It does everything we had with a very expensive vendor of the past 15 years and it does so better, with more ability for customization, and is free to smaller churches. Larger churches should support the core team for sure, but even that isn't forced. The heart behind this product is incredible and the product is constantly improving with 2-3 major releases a year! We're seeing more flexibility and customization happening than we've had in the past 15 years combined and we're on year 1 still. Cons: - There is a learning curve with self hosting, but there are 3rd party partners that you can pay to migrate or set you up, and extensive step-by-step documentation exists as well. - You don't NEED a developer to use this, but having one can sure make things easier and allows you to customize. Overall: This is a monumental shift in what is out there. Instead of shoving your church data into a pre-built box solution from a vendor, this is a set of Legos that comes pre-assembled, functional out of the box, but allows you to fully customize what you see, where you see it, and even how it looks. If you have further skills, you can even code your own integrations with this. They didn't lock it down like so many vendors do. Pros: Rock is so powerful right out of the box but because it is open source, intuitive, and there is huge support community that comes with it...Rock has completely transformed our IT department. We can quickly delivery small, medium and large asks from all areas of ministry. This in turn is changing how the ministries are looking at processes in general and they can see results. Cons: Truthfully there aren't really cons, the folks at Spark are awesome in helping us to customize where needed on the more complex functions and where it make sense they actually add the functionality to core product. They are growing and so is the community of Rock developers. Overall: We were on Arena and migrated to Rock v7.3. Before go live we did a huge amount of planning, process redesign with the inidivual ministries as well as training everyone. Once we went live, we had probably the best softwear launch ever in my 20 years of managing software releases. We launched to 9 campuses across kids, students, volunteer check-in, events, connects, groups, and next step registrations, integration with Pushpay and Secure Give, email and text to workflow etc. We are getting ready to deploy 7.4 next week and will start testing v8. We are super excited to start utilizing content channels to basically replace our website and have partnered with a group of churches to build a mobile app completely open source with Rock as the back end. Our mission is to impact our world with the love and message of Jesus Christ to everyone, everyday, everywhere. Rock helps us to use technology to do that! Recently implemented Rock install and loving it. Pros: Rock's feature-set far exceeds our previous solution that cost > $1k / month. Biggest pro is access to data: if we are recording the data, there is no limit to how it can be processed or viewed. Second biggest pro is flexibility: the entire software is open source and extensible. Beyond that, we were very surprised at how much customization and flexibly were available without ever writing a line of code. Lastly, Rock is a much more polished solution than other options we've looked at: more features, mobile friendly, a UI that just makes sense. Cons: The flexibility definitely requires knowledge and time to setup and administer. We definitely wouldn't change that because of the flexibility it provides, but you should expect to need a knowledgeable point person that has time available. Overall: Lower cost, more power, more flexibility, greater ease of use. Pros: The Development team - they continue to crank out quality updates that are flexible to the unique needs of various churches, but are powerful and relevant to what we need. The pricing model also works for non-profits. There is no cost, but you are encouraged to support the product based on the number of users you have in your church/group. We transitioned to this product from another product that cost us in the five figures to purchase and then also to maintain/develop. Not only has our experience been better, but we are excited about what is coming. We do support the development team as suggested because we believe in the mission of the company and in the product they are producing. Cons: Some features that we had in our old management System are currently not available although that is rapidly changing. A missions trip module has just been developed and by the time of this post, should be publicly available. Overall: Customizable, powerful Relational management system for our church that also drives our website. Comments: Rock RMS is the future here at Central Christian Church in Arizona, where I work as the Network/Systems Administrator. We are migrating from Arena (Shelby) to Rock this year. As a large church (10,000+ weekend attendance and five campuses) we have robust needs and requirements for our Management System; from event check-in, communications, website, people management, contributions, process/workflow management, reporting, and more. I have been able to watch Rock develop from a bare-bones system (v 1.0) to a robust and feature-rich product that can perform all the functions a church like Central needs. But, it is flexible and intuitive enough to be used by smaller organizations (not just churches!) without robust in-house development and IT support. For me, the biggest feature/benefit with Rock is its flexibility and configurability. As you think about the data you need to maintain, the tasks you want to automate, the ways you want to communicate, you will find that the flexibility with Rock can make it possible. Spark Development Network is actively developing the product, adding features/function/polish. As an open-source product, Rock RMS is also seeing an active and growing 3rd party developer community offering further improvements and features. The support community is also developing rapidly, as more people use the product and become familiar with it. The community forums are a great resource for users to get their questions discussed and answered. Finally, the documentation that Spark has provided (and continues to create/update) is fantastic! There is a treasure-trove of manuals and videos that dive deep into all the great functionality in Rock, without being too technical or difficult to consume. My experience with Rock, and the community surrounding it, has been excellent. I know that the Spark Development Network team (and others) have been working tirelessly to make this product as excellent as it can be. And, the work continues! Not only is it the most affordable, it's simple the best! Pros: I love how flexible it is. We generally don't have to worry about workarounds like we did in systems past. We love how it fixed so many of our difficult problems without becoming a problem itself. The community is also a great part. You aren't buying into a company, you are joining a community. Cons: Waiting for the newest features and tools. It can seem like forever when it's something you didn't even know you needed until you heard it's coming soon. Then you have to wait until it's polished and ready. When it's here though, it's basically Christmas. Overall: We are using the Rock to help us bring together the reach of the web and the power of data to make disciples. Pros: Customization, ease of use, powerful tools, Rock Community. Overall: Knowing the investment of time and learning needed, we were looking for the right church software for several years. We were impressed with the rock community and the potential with the software 18 months ago. We implemented a few portions of the software 12 months ago, and decided to baby step our way into all of its capabilities. We knew early on in the implemtation process that Rock was going to something really good for us. And already, with out even using all of the features, we are in love with the program. We don't even want to think about the "dark ages" (life before Rock RMS) any more. As a church administrator and a ministry leader of a church, Rock has been an incredible resource for our church. Recommendations to other buyers: Rock is worth the investment it takes to implement at your church. We could not take the complete plunge and implement all in one day, so we took an approach to implement over 12-18 months, and it has worked well for us. Pros: Out of the box, Rock comes with, based off of the different systems we've used, the best and most well thought out feature set for tracking congregational involvement and reaching out to the people at your church. The developer's commitment to make these tools available to churches of any size and resource level puts this software into a class of its own, which is truly focused on utility and ministry needs, not providing some tools in return for collecting huge monthly fees as well as processing fees from the church's tithe money. Additionally, because the software is open source, there's a large and growing community of users who support each other with their experience and expertise, in a way that's generally much faster than support we've received from competitors who were paid large amounts to support their own product. Pros: Adaptability, the community of support, the core features, the cost. Cons: Finding a good external hosting company, wanting to do more beyond core features but needing increasing skills in IT and Development that we currently do not have. Overall: We have been very pleased with Rock's capabilities. What comes in the "out-of-the-box", core features has been so much for us to explore and implement, while also having the ability to grow in almost any way through all the open ended features if you have a capable developer to bring larger churches to the next level. As a medium sized church we have found that with a little work we can have Rock doing so much for us that we weren't able to do with a pervious database. With no developer on staff, I have still been able to learn some basic things that have helped us go beyond the core features and tailor-make Rock do things specific to our needs. Recommendations to other buyers: Plan a strong implementation, test, test, test and use the community resources on the website and through slack for support issues. The community can help you! One size never fits all, but Rock can be molded to fit perfectly. While not required, to get the most out of it you'll want some experience with HTML. Overall: Rock RMS is a community supported (support can be provided by a third-party at cost) open-source (meaning it's free as in 'freedom' and free as in 'free food') ChMS. While Rock, I feel, takes a bit longer to get setup and running compared to other options it does allow you to customize a lot of aspects of it. I would highly recommend reading their awesome documentation to get started. Once you learn how to play with and use all the neat little tools and Lego blocks to customize Rock for your church you will feel like a super hero! If you ever get stuck, the Rock community is always willing to help. I've only just begun to unlock the potential Rock has and I'm very happy with it. Pros: We loved the fact that there would be a cheaper and just as effective alternative to Community Church Builder. It has all of the bells and whistles that we would need and seems like a super slick platform. Cons: Well, it'd be great if we could get it launched. We wished that there were people that Rock RMS would suggest us to contact in case we wanted help in launching the platform, building/setting up the server, etc. At this point they provide several manuals on how to implement, which is great if you are super "tech savy" and know your way around servers and deployment of sites, but we don't. So in other words, there isn't a lot of direct support to get implemented...people that will help you or do it for you, from start to finish. I did post some questions on their forum and answers were given really quickly (which we did appreciate) but the answers were given at a level that you'd have to have enough server/web knowledge to understand what they were saying. Hi, Adam. You're right, support does look a little different in our open source model. We do have the online guides and videos, and the Q&A site, but it sounds like you might have missed our Rock Partners. They offer migration and support services. You can find a listing on our website at: https://www.rockrms.com/partners?Category=13. Pros: Easy to use and visually easy to see what I need to see to do my job. I can easily find the information I need to know about the parents of the children I am responsible for. I can see history and make informed choices about the future weeks instead of going off my gut and memory. I now have the tools to save money and love people better that are in my ministry. Cons: I haven't found anything yet that has been a problem. Overall: I get to use Rock as a team leader for our children's ministry. I use it to help track attendance for children week over week to see that parents are not showing up and help me to know to ask the parents how they are doing and if I can serve them and pray for them. Pros: The ability to do so many things without having to be a developer, etc. The community that supports Rock is amazing and answers questions to much faster than any tech company. Out of the box Rock does so much more than your usual church management system, but the fact that you can customize so much of it without having a developer, has truly changed my job as a DB Admin in incredible ways. Cons: There are some assumptions made about how you should handle your data that I would make differently. So, it is a little frustrating when I run up against those things, but the community is always there to help with a solution. Overall: The people are friendly and reachable. The Core Team listens and makes changes when needed. By far, so much better than any corporate software company I have dealt with. Pros: - Customization gives you possibilities. - Send communications (emails, SMS text) directly from site. - Create reports and see data on metrics. Cons: - Customization/open source means you have some up front work when you want to use new features. Overall: I am part of a church plant in Miami, FL. We started off using Rock RMS, and it has been a huge help for building our church and keeping communication intact on our team. We have two full time staff members, while everyone else is part time or volunteering, so we don't have the budget for a huge database that comes fully equipped with certain features we don't really need yet. Rock RMS is open source and very customizable. It takes some time to get it up and running, and we had great support from their team (thanks again, Trey!). One of my favorite features is the ability to send emails or text messages directly from Rock RMS - it saves me tons of time each week! I'm excited for all the possibilities Rock RMS will give us as we grow. Recommendations to other buyers: If you have any people in your community who are software savvy, get them involved to set up and using Rock RMS will be a breeze. After that, literally anyone can use Rock RMS with minimal training. Pros: It's easy to learn how to use and it does everything I would want a church management software to do. Overall: The Rock has made keeping up with the people in our church almost effortless. Attendance, membership dates, prayer requests, specific needs, and reminding us of upcoming birthdays are just to name a few things it does for us. With profile pictures, important dates, and connecting people through the relationship feature, this software not only helps formally build our records, but informally we are able to get to know our members and visitors better. I have loved everything about the Rock. Recommendations to other buyers: The Rock doesn't cost you anything. If you are looking for a church management software I would encourage you to at least check it out. Pros: The fact that Rock is so customizable and learning how to utilize that customization capability is so easy, makes this an incredible software. It has impacted the way we interact with our congregants in every way. Also information is easily accessible to our staff and easy to find. Cons: To utilize it's full capability you need a staff member who is devoted to learning the ins and out. You don't need to hire someone specifically for Rock but you do need someone on staff who is willing to learn the ins and outs and put the time in to make it great for your organization. Perfect for our church. We love the functionality and you can't beat the price. Pros: We love the features out of the box but the strength of Rock is that it can conform to the way you do ministry. Most Church Management Systems constricts you to doing ministry their way. Rock fits to your processes and procedures. The automation with workflows is a huge time saver leaving more time for ministry. Cons: The support system is weak compared to other Church Management Systems. They need to provide a better on-boarding experience. The manuals are good but not everyone learns by reading. I would suggest more videos and examples in the manuals. Overall: Rock has more robust communications, including texting. Workflows to automate tasks are a huge time saver. Each member's profile page is clean and has everything you need at your fingertips. This product had revolutionized our church management. Pros: It's so easy to use. You can create whatever data metrics you choose. I love how I can keep track of our church members and put faces with names. Cons: You have to really think about what categories you need with the program. There are also several steps to forming groups. Overall: The organization of member information enables us to minister more effectively to their entire family. Pros: Implementing the Rock RMS system was the biggest thing that we did to be able to better understand - and structure - our church data. It is user friendly for ministry leaders, yet powerful enough to build strong analytics from it. The open source model creates a network of partners that can help you out if you don't have a large IT team. Cons: There is still a learning curve with Rock, and probably a few too many data fields (that can cause confusion at times). Pros: The team that supports Rock is incredible, and the people/Churches that use Rock are incredible. The ending result is a momentum that has fast forwarded Rock RMS past most, if not all, of the top applications that have been around for twice as long as Rock has. Cons: Nothing to report here. Rock so far has worked to close the gap on anything that arises as an issue. Overall: Awesome, the team behind Rock has been incredible and the community via slack has helped me more than I can count and we are still just implementing the tool. If you are a developer church or if you are an admin that just needs to get your church organized, Rock has a solution that fits the smallest and largest of churches. Pros: There is nothing held back as far as access to your data. The community all works together to support and create add ons as well as core features. So enhancements are made quickly. Cons: It was overwhelming at first because it was so massive with its features. But given time, you can easily jump in and swim like a pro. Overall: We have been able to have our entire organizations RMS as well as our web page tied together in one application. So learning it is huge, but the time saved is well worth it. Pros: Easy to learn and use. Cost effective. Great community support. Cons: Lacks some of the features of other RMS systems, but they are continually improving it. Overall: The Rock Church has been using RockRMS for over a year and have been very pleased with the features and the community of users behind it. We would recommend this software to any church large or small. If all church software was built around this same paradigm, it would be so much easier for startups and smaller churches to survive. Recommendations to other buyers: Try it! It is free to try, so you have nothing to lose. Rock empowers the global church to grow! Pros: Our church LOVED the switch to Rock. 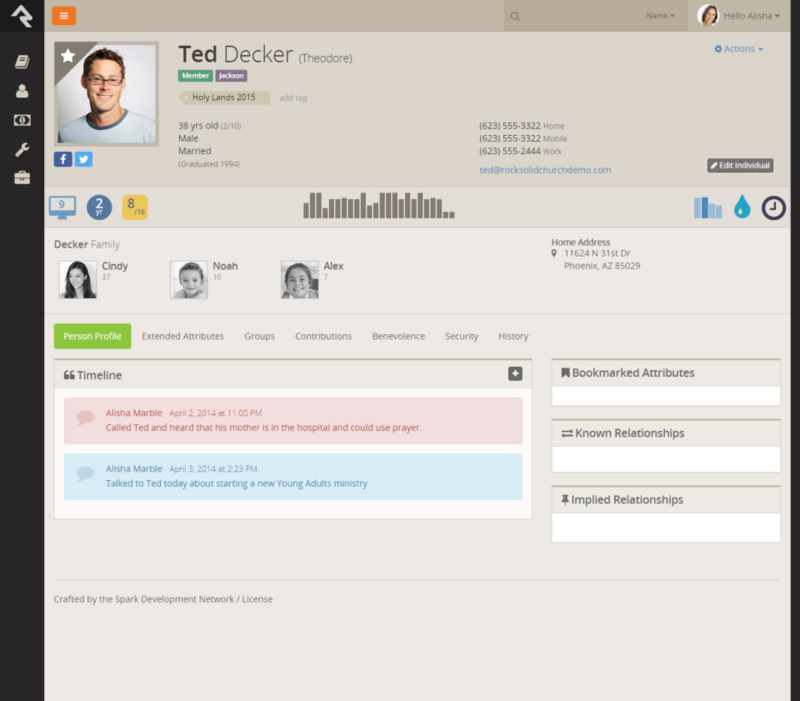 Its simple, clean and intuitive user interface made the easiest tool to train our staff team on. People were literally cheering and clapping throughout the training over the simplest of things. Cons: Likely a localized problem, but we had to migrate an EXTENSIVE amount of data over from our former database. We love all the data because it's so rich and has helped us grow, but we're still slowly gaining back some of the reporting capabilities we took for granted in our previous system. We miss the ability to mine all the data for great reporting, trend and pattern watching, too. Overall: As our church has grown, the issue of scalability was quickly becoming an issue. We had over 20 years of data to transition, so not just any church management tool would work. Rock is sleek, user friendly, but most importantly is ready to scale with the global church! It's already allowing us to reach more people and has simplified processes for our admin volunteers, which has already made more margin for staff to do ministry. Overall: We have been using Rock for about a year, and have already started to allow our church staff to focus more on ministry and less on administration to allow us as a staff to focus on the people and not on the event/administration. Pros: The ongoing development of the product. The donation model of license fees. The strong features for churches. The quality of the code. Cons: The new features that keep coming take time to evaluate. Overall: Since going live with Rock for our Church Management System, we have integrated more aspects of our church into one system, lowered our operating spend and improved our serve to our congregation. It has been more than we hoped for. Pros: This product can be tailored to handle anything. Cons: May be difficult to initially customize. Overall: I recently walked through the implementation of Rock RMS at a church I was working for. The software functionality is incredible and sports the latest in developmental advancements and functionality from Content Management to Customization. I don't think I have seen a more powerful resource management system (especially that is open source). The collaboration and creation of this software has been miraculous. I attended the Rock RMS conference in Phoenix about one year ago and could see that so many brilliant people were pouring their heart and soul into developing, testing, and refining this software. While it may always be in development, the team behind the software is great and the software itself offers capabilities well beyond other systems. While the implementation and setup may require some special skills (as well as the customization), there is support to help from a willing and intelligent community, which is the backbone of any great software. Recommendations to other buyers: Read the documentation carefully (which is also beautifully designed). Pros: This is a church software unlike you have used before. It is open-source, fast, user-friendly and completely customizable. You can use it out of the box with no issues if you desire and there is a community of churches waiting to help you with any wild questions you may have. Overall: It has been incredible - I have actually learned a TON of new things using this product. Just the fact that there is a community ready to answer any questions instead of a slow sale's staff saying they'll 'get to it' is great. Rock is designed by the church and has thought of every detail imaginable. Pros: The flexibility of what the rock can do is amazing! I don't know why everyone in church world isn't using the rock. It has been one of the best decisions we have made as a church. Cons: Least would be the time to build things out for more complex features. Wrapping your head around workflows at the beginning is hard but once you get it the power is amazing! Comments: The ability to look at my iPad or cell phone on my way to a hospital visit to see everything I need to know about the person before I walk through the door is HUGE! The way this software can be customized is unbelievable! We came from CCB and this is SO much more useful. The fact that it is free is great, but we believe in Rock and how it is designed for the work of the Church so much that we are donating money to further the development. Being a open source project you can look at the code. The top line of code is.... "To God Be The Glory". That says it all. Support is a funny word. With our past experience we had a number we could call and with enough time and the ability to explain the problem to the "right" person we could get a resolution... eventually. Rock itself has no number to call. What they offer is a community of users that are eager to help one another solve problems and develop customizations to the software to make it suit each individual ministry. I have found that with one post to the community forum I have an answer very quickly. There also is now a support company that has created a division to be a "one stop shop" for everything from hosting to support for Rock. ChMS software is just a tool. Our staff would not want to go back to doing ministry without THIS tool. Comments: We've been on Rock for about 18 months now. We are thrilled with the flexibility of Rock. We have complete access to all our data so any report we want can be generated. We have the ability to add fields we need and if needed purchase or write plug-ins to fill any integrations we need. The only function that isn't there yet that staff ask about is volunteer scheduling. We were able to do our migration to Rock ourselves. There are partner vendors available to help churches that don't have the IT staff to handle doing it alone. The developers regularly seek feedback on features and are very open about what is coming next. The community surrounding Rock is AMAZING! There is an active Q&A board and Slack channel. Questions are answered quickly by someone in the community. Questions and problems of all types are answered respectfully and helpfully. It doesn't matter if you are an IT person, developer or ministry staff, questions from the most basic to the super complicated are welcomed. The community is very willing to share anything that they have built or coded. Ask someone how they did something and they will likely send you the files or code needed to do it. It is great to have software, developers and a community that truly want to make my local church as efficient and effective as it can be! Pros: This system is easy to use out of the box, but also has many areas for customization. Cons: There is not a customer support area, but there is a huge community of users that can be utilized. Overall: We have been using this system for over a year, and the customization you can do is immeasurable. Pros: User Friendly. Web site and Church DB all in one. Lots of modern features built in to the core product. Cons: No Paid support ; although the community is very supportive via social tools. Overall: We have been using it for over a year and continue to be excited about future version releases. Pros: Open source, mobile friendly, customizable, constantly coming out with new features, ministry minded. Cons: Hard to learn, must be self taught. Significant computer knowledge needed. Overall: Rock is amazing! God is using this product and the people behind it and ALL about the church! Pros: The Rock RMS is a church management software that we recently began transitioning to from another leading provider. Our big attractions to The Rock were based in it's cost-effectiveness (it's an open sourced platform) and it's power. With knowledgeable programmers, it can be integrated to perform nearly anything your team can think of. It can also integrate with Planning Center Online. In addition, there are many options out there for help getting started with RockRMS if you are lacking the expertise within your local church. Cons: The length of time it takes to transition from our current church management platform to The Rock. It's understandable why it takes so long but it should be noted that it isn't a quick transition. Pros: Simplicity. UI. Integrations. SMS capability. Cons: Check in process, but it's getting better. Overall: We're moving from Arena to Rock for our church. We love the ease of use and that it's built mobile first. We look forward to digging into the workflows to make the most of its abilities. The community is great--we can jump on slack and get any question answered by people who know and USE the product daily. Recommendations to other buyers: Get involved with other churches who are using it. You'll find a group more useful than any paid tech support I've ever encountered. Pros: After years of using two other church database and communication tool solutions, Rock is a breath of fresh air. If far surpasses the previous solutions we have tried. We love it's intuitiveness and ease of use. It has a powerful feature set, yet is adaptable to each church's needs. It provides our members the opportunity to more easily connect with one another and with opportunities within the church. Cons: We have no complaints at all about Rock. I was concerned at first about the lack of a "tech support" department, but their online guides, user forums, and Rock partners who provide support have completely alleviated that concerned. We love Rock RMS! Pros: That I can access it from my phone or computer and that we can minimize the amount of info that people can see. Cons: I wish when searching for a person, you could click on the whole family, instead of each individual . Pros: It can be entirely customized to your church's needs. This means you can build the system to fit the ministry, as opposed to having to alter your ministry based on the limitations of the Church Management Software. Cons: A bit of a learning curve for an average joe, but there are great resources available and a very helpful community. The last ChMS you'll need. Comments: Rock is a sophisticated CMS with lots of church/relational management functionality built in. Unlike most of the competition, it is highly (ok, completely) customizable and can be considered more like a box of Legos than a completely pre-defined product... What you build with it is completely up to your skill level and imagination. While Rock has most of the expected features of a ChMS/RMS, its "killer app" is the Workflow engine. This functionality lets mere mortals "program" sophisticated operations that would normally take a developer. Combine that with "Lava" (Rock's implementation of Liquid markup) and you have an environment that's extremely powerful yet approachable by non-developers. The only "con" with Rock is that it's based on the .NET MS stack. Though some (LAMP stack zealots) find this off-putting (and it *can* be more difficult to find an acceptable Windows host on which to run this Enterprise application), this technology was chosen for specific reasons and there's no need to reject it based on one's predisposition to LAMP. It's solid. That said, the RockRMS site maintains a list of Windows hosts that run it well. Pros: Everything is highly customizable. The content channels allow you to maximum flexibility to present all types of information whether blogs, video, or documents. Cons: I'm a fan, no negatives for me. Overall: Extremely well-documented software, very high quality, we've encountered very few bugs and glitches. Recommendations to other buyers: Requires technical help in house, not for the faint hearted. Cons: communications module is a little clunky, but I know there is some improvements in the works. Pros: It is not as restrictive as most packaged software systems. Lots of flexibility to customize it to your organization's needs. Cons: Reporting is not the easiest, but can be done when you take time to think through it and create the needed reports. Overall: Customization of the product to our needs. Comments: Rock is THE ChMS to beat. It might not have every feature that some of the competitors have, but it also doesn't have the bloat of unneeded modules. You do not have to wade through a "rich feature list" of unnecessary applications. Every component has been intentionally designed and implemented. Overall, Rock has the core features that matter and will help your church. One feature example that stood out to us at Real Life Ministries is called the "workflow engine." Without touching an ounce of code, we were able to create a workflow that altered a person's connection status based of off their attendance, a highly useful tool for our ministries. However, the ultimate selling point for us wasn't necessarily one feature in particular, but rather the whole concept of "the sky is the limit" for design and function as it pertained to the current and future needs of our church. From what we have found, no one gives you that much freedom in a ChMS. Once again, the moment we found Rock we decided we needed to look no further.